Tritonal have steadily built an impressive dance catalogue over the past decade. The duo blends EDM and electro-pop while incorporating indie-inspired visuals. They could be described as a more personal take on The Chainsmokers, as the vocals and emotional buildup in their songs shows how they shine. Their unexpected bass drops have turned this duo into one of the biggest names in the festival frenzy. From Austin, Texas, they bring huge energy to the stage at events such as New York City’s Electric Zoo and Chicago’s Lollapalooza. After their extreme success from singles such as “Blackout”, “Hung Up”, “Strangers”, and “Good Thing”, they have made a name for themselves in the EDM community. They have rightfully deserved features such as “Untouchable” with Cash Cash and “Until You Were Gone” with The Chainsmokers, and mastered some incredible remixes for their collaborators Armin van Buuren and Rudimental as well as Adam Lambert. 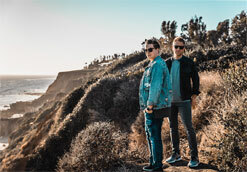 With 120 million streams on Spotify in 2017 and over 3 million monthly listeners across several studio albums, Tritonal are preparing themselves for the next shift in their sound. Tritonal’s latest music video for “Love U Right” (featuring Lourdiz) stars a happy couple with a tragic twist. Directed by Peter Hoang, the video opens with a fast-paced goodbye to end a rather lengthy romance. Despite their physical distance in the midst of a breakup, they meet each other in their dreams as contrasting vintage shots are pictured throughout. As their fun-spirited arcade game and beach trip are captured, the memory of the relationship is all-encompassing. The tragedy of lost love is highlighted and depicted as cruel intentions or miscommunications have led them to be apart. Through the visuals and lyrical content, they share the message to fight for the people you love because your fate is uncertain. As the video comes to a close, they come together at the end, unsure and anxious at the prospect of facing life alone. Once again, we’re absolutely ecstatic to be working with Tritonal to promote the “Love U Right” music video! We sincerely hope you embrace this clip like we have and consider including it in your regular programming and online presentations. Rest assured we’ll have plenty of Tritonal merch available for on-air contests and giveaways so don’t hesitate to get in touch. For more information on Tritonal please contact Andy Gesner and the HIP Video Promo team at (732)-613-1779 or email us at info@HIPVideoPromo.com. For recent updates on Tritonal check out www.Facebook.com/Tritonal and www.Instagram.com/Tritonal.